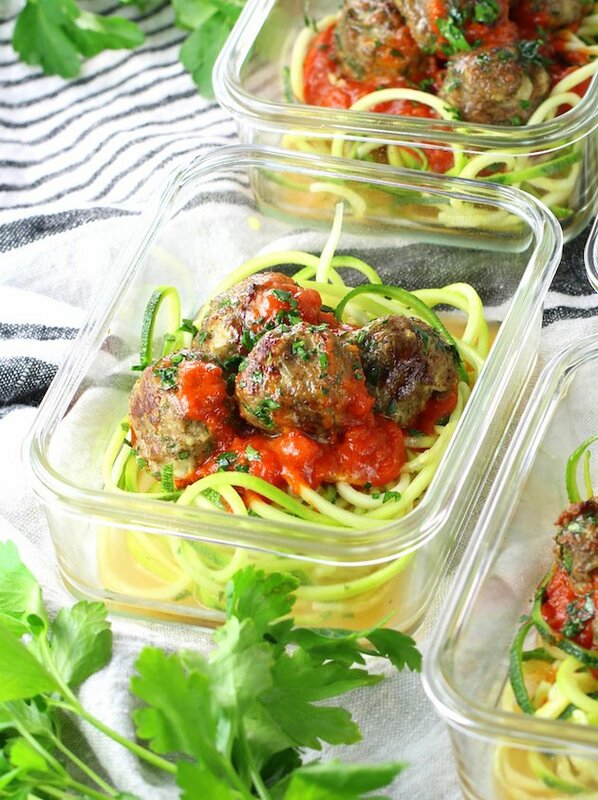 These Healthy Meal Prep Baked Turkey Meatballs are going to be an amazing addition to your healthy eating plan! 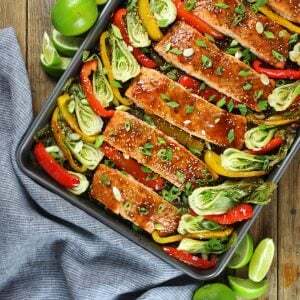 They’re loaded with lean protein and lots of delicious flavor! 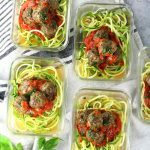 This recipe makes 45 meatballs and they freeze perfectly – a fabulous recipe to help you meal prep for the week! So I’m just becoming kind of a junior meal prepper, and meatballs are one of my favorite ways to eat protein. I love that you can pack in so much yummy flavor… plus, they’re so cute with their little bite-sized selves. 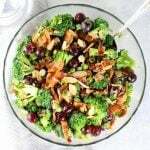 You can adjust them to whatever your diet preferences are: gluten-free, soy-free, dairy-free, low-carb… the possibilities are endless. 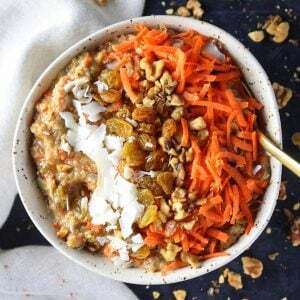 They are super versatile in the never-ending quest for healthy lunches – or even healthy breakfasts! 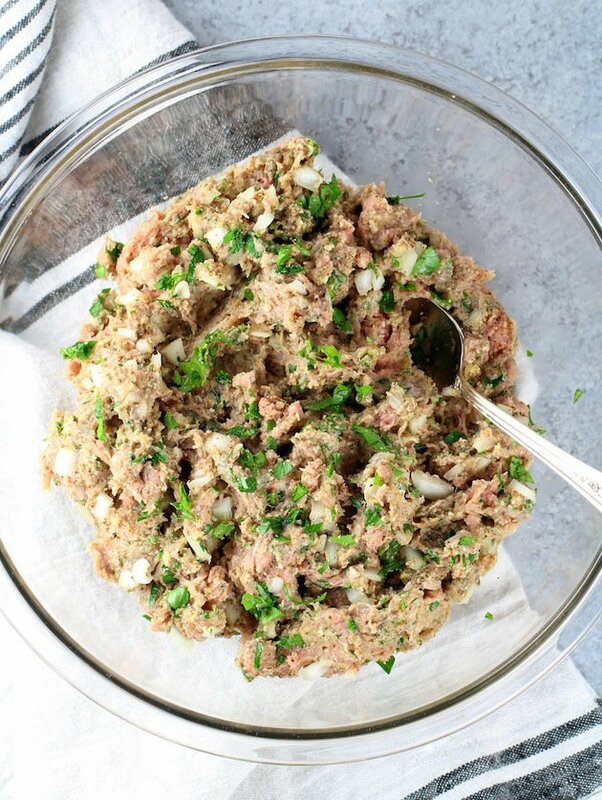 You could use ground turkey, chicken, pork, beef or lamb, or combination them… whatever suits your needs or desires. I have a bunch of amazing baked meatball recipes on the blog already… buffalo chicken meatballs, Vegan meatballs, Italian meatballs – so many flavor bombs to choose from. Today I wanted to add another yummy meatball to the line-up that could be used in variety of ways… Baked Turkey Meatballs! They’re perfect for soups, chilis, salads, energy bowls, pastas, pitas, subs… the list goes on and on. 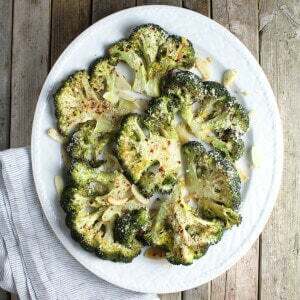 You could even serve them as appetizers with a tasty marinara or a cheese sauce. Mmmm. These little guys are so delicious – It’s hard to stop eating them. 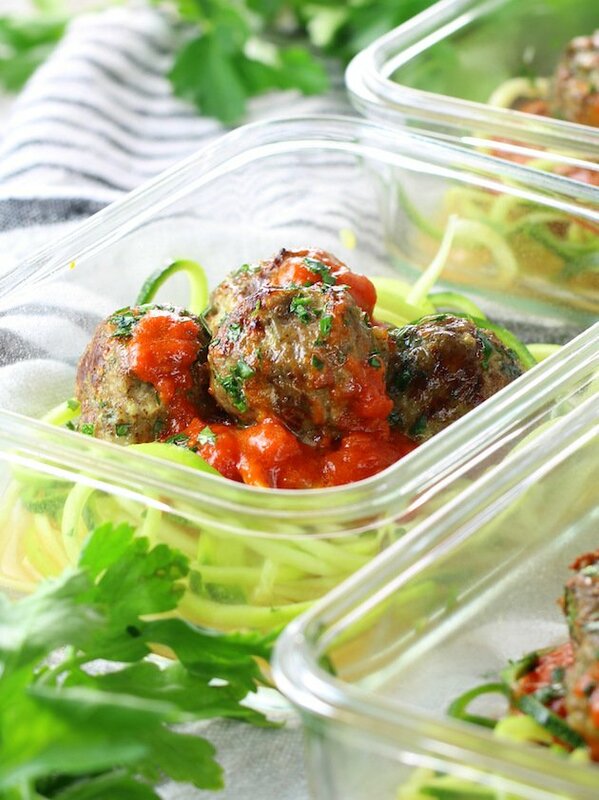 But that’s not all… these turkey meatballs are gluten-free, low-carb and low-calorie, and they bake in 15 minutes. Whaaa!?? Crazy talk – right!?? 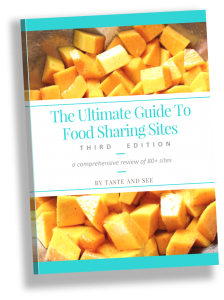 They can be the basis for so many delicious healthy freezer meals too! I know – you may need to pinch yourself cause this is really happening my friend. 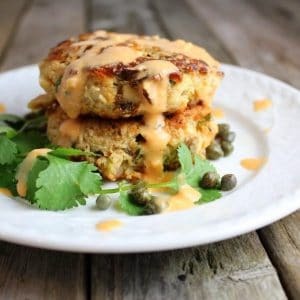 These little meat bombs are not only versatile and super tasty but they’re also perfect for meal prepping! Yep – we’re going there. 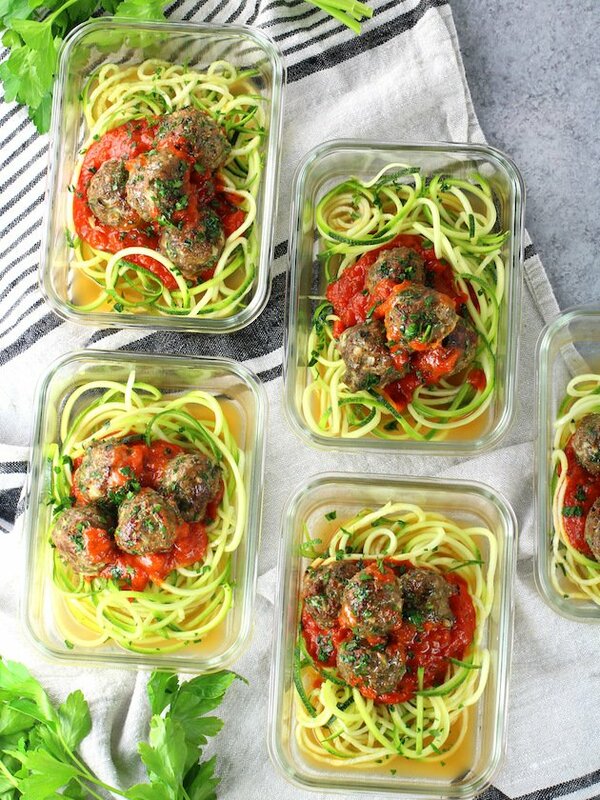 Whip up a batch of these meatballs, freeze half and use the rest for meal prep dinner or lunches for the week. They’re delicious over veggie noodles or with pasta and red sauce. They make a great sub sandwich – just add your favorite veggies and sauce, and voila! Subway on a whole ‘natha level. 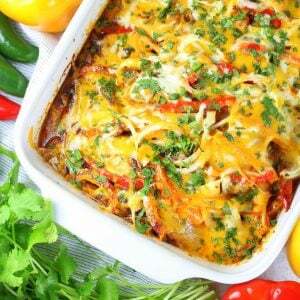 Add them to your favorite chili instead of ground meat. Stir them into some hot broth with veggies and spices for a delicious hearty soup. Swap them out for the protein in your favorite energy bowl or salad creation. See, like I said – they’re so versatile! And since we’re baking them and using low-fat ground turkey, they’re actually pretty good for you as well. 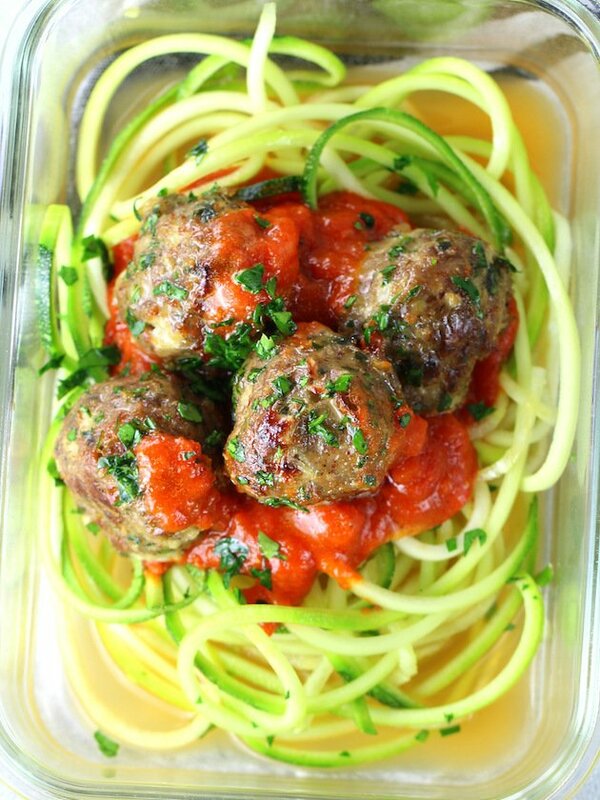 These healthy turkey meatballs are definitely winning! Let’s get to it shall we?? First, preheat your oven to 400 degrees. 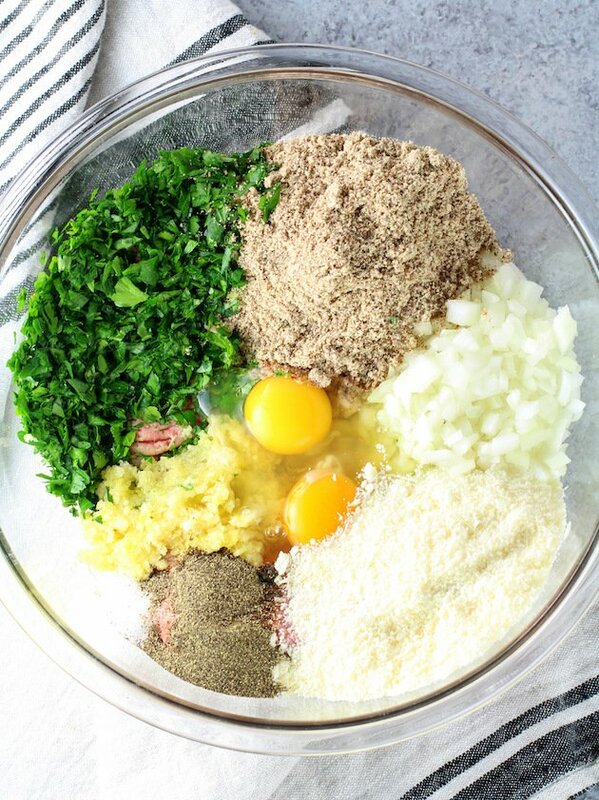 Next, add all of your ingredients to a large mixing bowl and stir until everything is mixed together well. 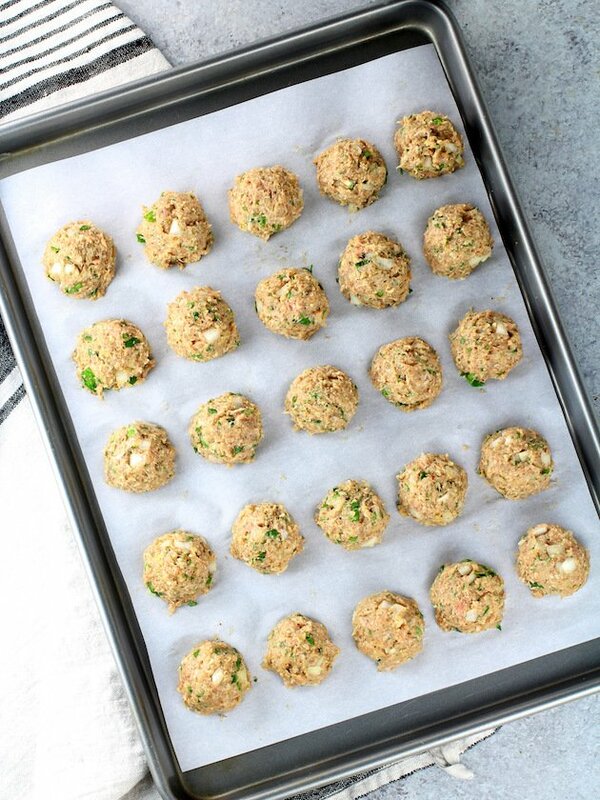 Using a 1½ inch scoop, roll 45 meatballs onto 2 parchment lined baking sheet pans. Bake for 15- 20 minutes or until a meat thermometer reads 165 degrees when placed in the center of a meatball. Whatever it is I’m certain it will be delicious! 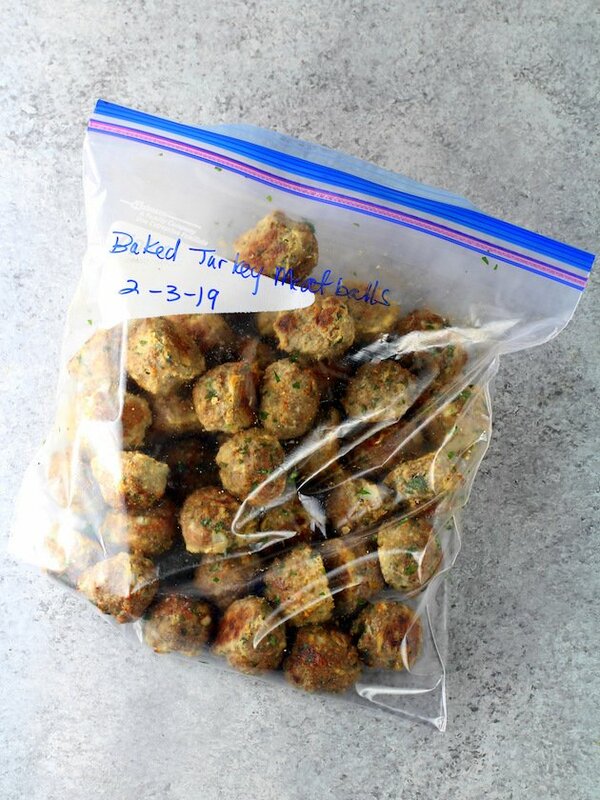 If you’re freezing the meatballs allow them to cool completely and freeze them in a large freezer bag. They’re best when used within 2-3 months. For meal prepping lunches for the week use some PBA free Tupperware containers or order some of these glass or plastic meal prep containers from our friends over at Amazon. 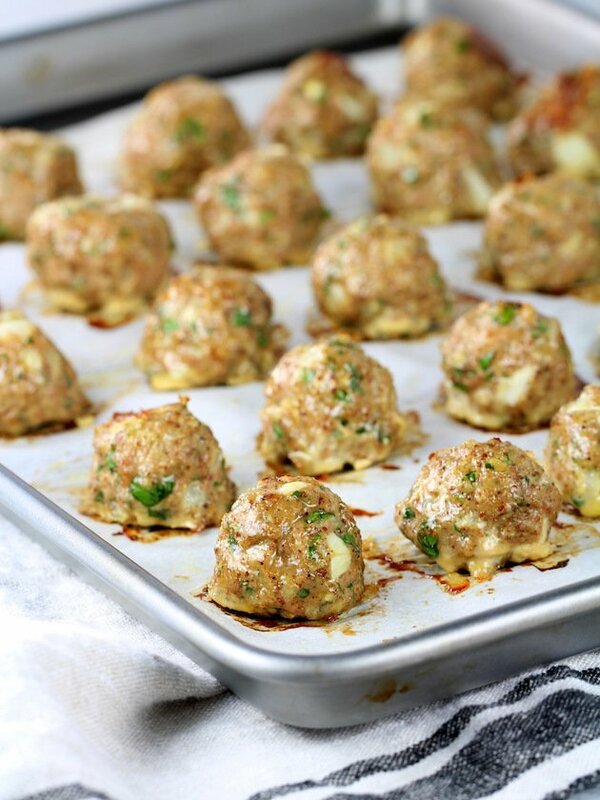 I’d love to know what creative meal prep ideas you come up with for these turkey meatballs… let me know!! 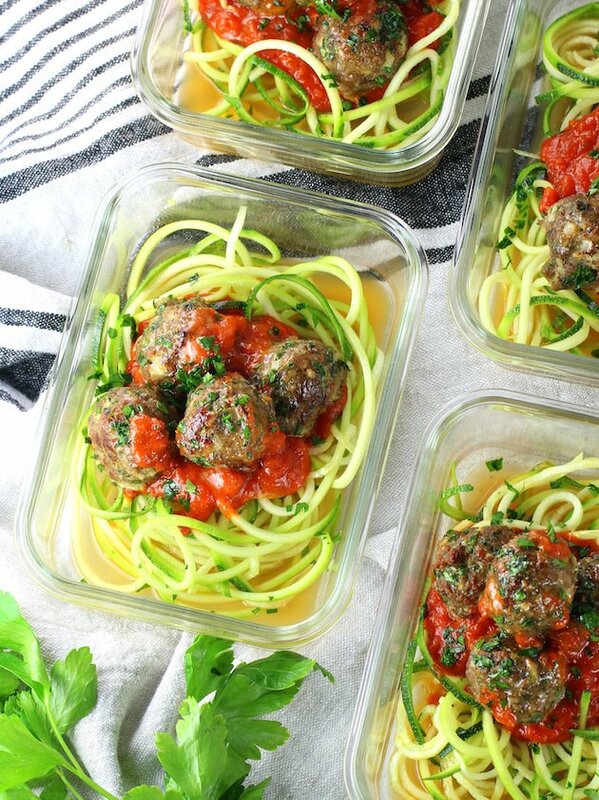 These Healthy Meal Prep Baked Turkey Meatballs are going to be an amazing addition to your healthy eating rotation! 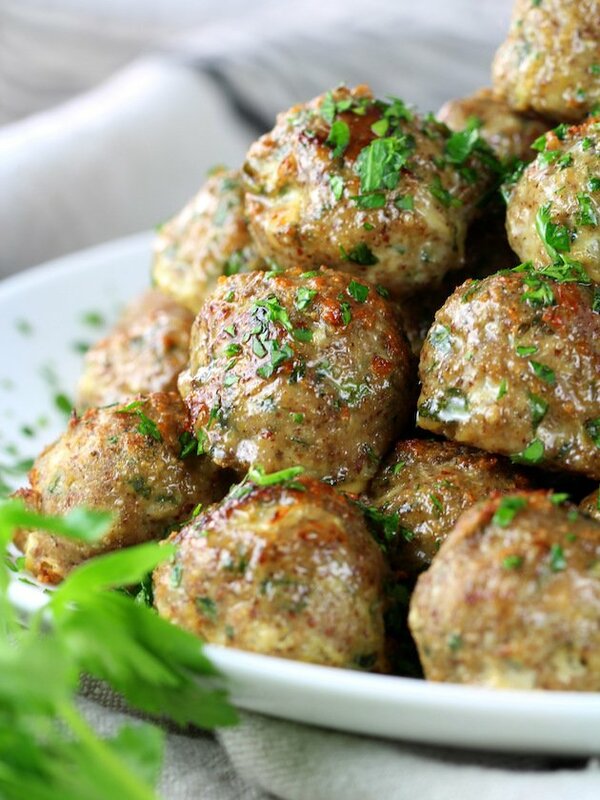 Loaded with protein and super-lean, this big batch meatball recipe can feed the family for days. Preheat oven to 400F, and line a baking sheet with parchment paper. 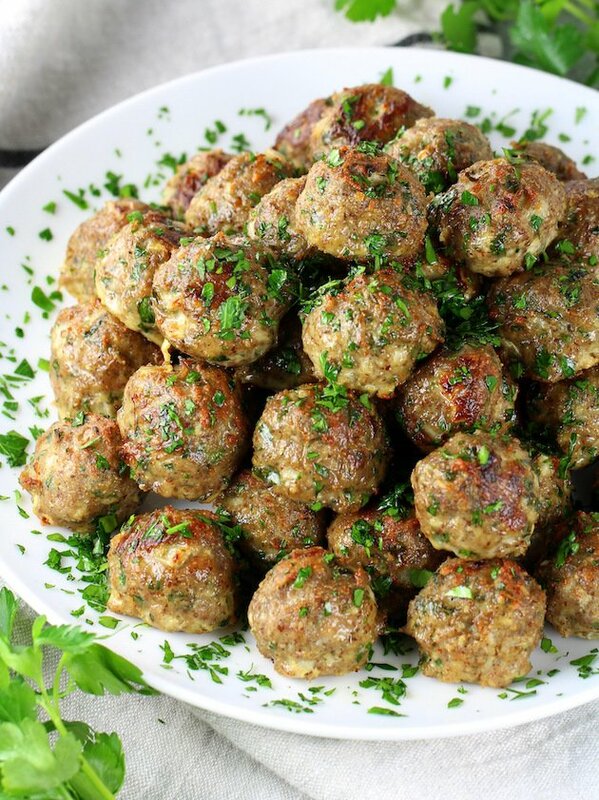 To make the meatballs, add the almond flour, parmesan cheese, salt and pepper to a large mixing bowl and stir together. Beat the eggs and stir them into the bowl. Stir in your parsley, onion and garlic. Now add your turkey and mix together just enough to get everything evenly distributed. Bake at 400 for 15-20 minutes. 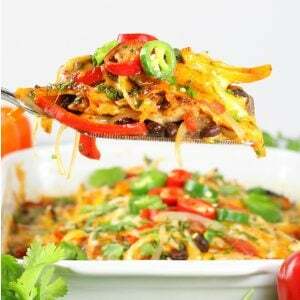 Serve warm as part of your entree. To freeze, allow the meatballs to cool completely. Then freeze in one large freezer bag or divide into portions in smaller freezer bags. 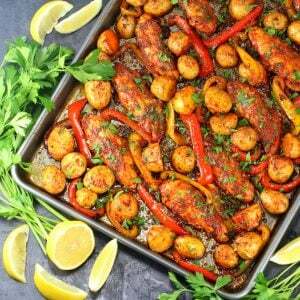 Looking for more amazing easy baked meatball recipes? I made these last night. So moist and delicious! I cut recipe in half because I only had a pound of ground turkey. Forgot and added all salt and pepper but they were still wonderful. I’ll make these often and freeze. 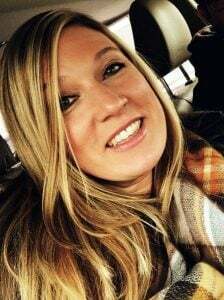 Yayyy – I love hearing that, Kathryn! We love them too – I seem to always have some on hand in the freezer. Thanks so much for sharing your feedback!